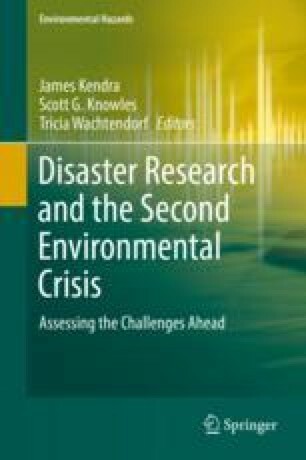 The genesis of this book was the 50th Anniversary Workshop and Celebration of the Disaster Research Center at the University of Delaware in 2014. In marking that milestone in the history of the center, we wanted a workshop in which participants would reflect on what is known about disaster science—much of which is owed to DRC, to its long lineage of intellectual descendants, and to their scholarly cousins in a variety of fields. We wanted to assess where that knowledge is uncertain, where new or reinforced knowledge is needed, and also to think about the state of practice. For this collection, authors were explicitly encouraged to be provocative; to be iconoclastic; to be speculative; to try as best possible to bring in new ideas or different approaches to familiar themes. In this first chapter, we consider some of today’s pressing environmental challenges and the associated research needs, moving from there to introduce the chapters and their overall contributions to this volume. The 50th Anniversary Workshop and Celebration of the Disaster Research Center was supported in part by a grant from the National Science Foundation and a gift from E. L. Quarantelli. The views presented in this volume are solely those of the various authors. Knowles, S. (2014). Flood zone foolishness: Politicians from disaster-prone states lead the fight against real disaster reforms. Slate. https://slate.com/technology/2014/03/biggert-waters-and-nfip-flood-insurance-should-bestrengthened.html. Last accessed 23 Dec 2018. Murphy, K. (2010). Shifitng soil threatens homes’ foundations. https://www.nytimes.com/2010/03/04/garden/04foundation.html. Last accessed 23 Dec 2018.